Last night in a Luxor sidestreet on my quest for the best or the most bizarre fake artefacts, in a grubby shop I'd overlooked before, I was offered several shabtis and shabti fragments which I am pretty sure were not fakes. All the dealer offered as provenance was "here and there". After I had correctly identified the fakes he'd mixed in to test whether his customer knew his onions, he showed me a lot more. I told him that in his country there was a new law under discussion which would make merely having them in his shop punishable by up to twenty five years. I was not terribly surprised that he would not show me the "authentic scarabs" after that. Those suppliers "here and there" who sold them to him knew that these items were saleable to visiting foreigners. The day before, I was walking across the palace site at Malkata, showing it to some colleagues, and had just replaced the cardboard "protecting" the wall paintings when a guy in a dark robe came running up. "Closed, closed, zis site he closed" he panted. He was presumably the "gafir" who was guarding this site for the SCA. Once he realised he could not make cash out of showing us the wall paintings which I'd just shown people, he then pulled out of his pocket a blue-painted sherd, the "Armarna ware" which I have seen on the Internet being sold at 300 dollars a piece and asked whether I would like to "see" it. It looked remarkably like the one I'd found there a few weeks earlier and put under a nearby bush to protect it from the sun and weather. I told him where he could put it. Interestingly this was after I had pulled out the photo-identity document issued by the SCA authorising me as an archaeologist to visit sites like this. What is interesing about this is Malkata is littered with pottery, tonnes of it. Most of it from the Eighteenth dynasty, including some nice red wares (lovely colours), slipped ware, fine bowls, burnished ware. Yet neither of the would-be vandors had picked any of this up, they knew their market, the blue-painted pottery is coveted by western collectors and that is what they were stealing from the site to make a bit of cash. It seems to me to be utterly pointless special pleading to deny that this sort of thing is part of the case for the proposition that current modes of no-questions asked collecting are directly contributing to the creation of the market which is the motor behind the looting of archaeological sites for saleable objects. In a thought-provoking post about a recent metal detecting rally our friends Heritage Action comments that the venue of the rally "totally flouts the official Code of Practice for Responsible Detecting and the Guidance on Metal-detecting Rallies which requires activity to be confined to disturbed ground that has been ploughed within the last five years" and asks whether "the locals understand why the organisers say this: “Only finds that are subject to treasure trove are to be divided fifty/fifty with the land owner”?". Good points made here. Please read it. "Demand for metal detectors has soared since Anglo-Saxon treasure worth £3.3million was unearthed last year. Tesco are selling thousands of the devices since treasure-hunter Terry Herbert found the hoard in a field near his Staffordshire home last July. The supermarket giant decided to stock a limited number of detectors for the first time last month and they have become one of their best-selling items. Spokesman Matt Finch said: "The find really captured the public's imagination. "We know if we could sell one for £10 as a trial it might prove popular as an unusual present but we didn't expect such a high demand. "We're now looking into extending the range." "the dealer who sold the ACCG coins for its test case had his coins delayed at Customs for some four days. 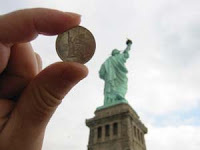 This meant he missed almost half [of some New York coin] show. [...] the dealer in question also indicates that other shipments to the United States have also been delayed since the ACCG imported its coins back in April.[...] is it all just a coincidence? If not, it certainly does not speak well for officials at the US Customs Service." On the contrary, it speaks very well for their vigilance. First of all for there to be a "test case" the coins had to be seized as imported in infringement of the new requirements of US law, in other words as illegally imported. This is what the coins were actually bought for (and we can only assume that those responsible in the ACCG informed the hapless dealer what their intention was). I'd say if a dealer was sending coins to the US and unaware that the law concerning that particular kind of coin had changed, then his further transactions should also be examined, as who knows what else he is doing unawares? Or if he knew (how could anyone in the trade not know?) and was ignoring that requirement, then even more should he be subject to careful scrutinty. Would you buy a coin from this guy? (We note Tompa refuses to name him, presumably for that very reason). As I have pointed out here several times, according to US legislation, all the seller of these dug up coins actually had to do was to provide the purchasers (importers) with one piece of paper signed by himself affirming the coins imported through Baltimore in the ACCG coin stunt were legitimately obtained according to the requireements of US law. He failed to do that. I would say it is precisely this kind of dealer, who fails to fulfill even such a minimum requirement which should be under very close customs scrutiny, whether they are a member of the PNG or the IAPN or not. Let him learn by his mistake of associating with the ACCG dealer lobby and getting involved in their self-serving stunt. He made his bed, let him lie in it. "to make improvements to the educational and numismatic content of the Classical Coins website". An odd one that. How many firearms salesmen include educational material on their websites do you think? What about used car salesmen, cut-price "Rolex watch" salesmen? So why an ancient dugup coin salesman - almost as if he's trying to prove something - or maybe draw attention away from something? To make no further attempts toward dialogue with anticollecting zealots. It has now become abundantly clear that such ideologues are not open to reasoned discussion, and that no possibility of any cooperative settlement exists. They will presumably continue their misguided, unrealistic campaign against private collecting, seeking imposition of drastic restrictive measures on international trade in ancient coins and other artifacts - which they naively imagine will miraculously safeguard archaeological sites from looters - regardless of real and very serious injustices such measures would inflict upon private collectors and upon the ancient and honorable science of numismatics. "The end justifies the means." Further discussions on this subject will now take place where perhaps they can accomplish something useful: in court and in the halls of legislatures. Mr Welsh's "attempts at dialogue" can be seen on his Unidroit-L discussion list. I think we can all see that there has been no dialogue there whatsoever, and a few moments trawling through the posts (mostly by Mr Welsh) will show why, and why nobody much has been in any hurry to try and discuss his "ideas" about why collecting contextless dugup antiquities is such a "good thing". His blog is very much in te same vein. This is thoroughly typical of the entire milieu of dealers and collectors. A series of (as I have tried to show here) half-brained "arguments" which do not stand up to any scrutiny and fly in the face of logic, supported by glib chauvinistic and xenophobic statements about why non-white citizens of the "source countries" cannot be trusted to have a heritage all intended to persuade the reader that it is all (the saleable bits that is) better off in the shops of the likes of Mr Welsh. Now of course the people to whom he is referring as "zealots" are not against collecting as such, but the type of irresponsible collecting which refuses to attempt to differentiate artefacts which have found their way onto the market by legitimate means and those that have not. For the careless collector the mere fact that they are on the market means they are OK to buy. I really do not think that those who urge a development of responsible collecting which ascertains the legitimate origins of the acquired items really can be called "anti collecting zealots". Responsible collecting advocates, yes. So, from that entirely reasonable point of view, what dealer Welsh is in effect saying is that he refuses to enter any kind of dialogue with responsible collecting advocates. The dealer specifically refuses to help responsible collecting advocates find a cooperative solution to the problem of looting driven by the current form of the market. He is only interested in meeting them in a court room (which actually I would be very glad myself to see). The dealer simply denies that the placing of a market value on and selling of contextless artefacts in any way encourages their further production (that goes against the whole notion of supply and demand). I would say that the possibilities for any kind of dialogue with somebody who holds such a view are limited. Actually it is not Welsh and the other dealers that is making "attempts" at dialogue with collectors, but the side he so adamantly opposes. The Portable Antiquities Scheme, an initiative of British archaeologists and museums staff is just such an attempt, is it not? What - precisely - have collectors of dugup antiquities in Mr Welsh's country done (or "attempted" to do) which is the equivalent? Unidroit-L? That's a laugh. The reason why the collecting advocacy wishes to cast responsible collecting advocates as "anti-collecting zealots" who will not listen to their arguments in favour of a continuance of a no-questions asked trade are obvious. The dealers and no-questions asked collectors in fact have no arguments in favour of continuing this sorry and damaging trade in the second decade of the twentyfirst century - not ones that stand up to scrutiny. Instead of defending their position, dealers like Welsh and other pro-collecting bloggers are currently tending to back down and pretend it is the "other's" fault that discussions are getting nowhere. The fault is clearly with those that are in denial about the nature of the damage done by the no-quetions asked trade in portable antiquities and current modes of collecting. Mr Welsh and his fellow antiquity dealers can huff and puff and indulge in setting up dodgy "test cases" and threaten court action and other such measures as much as they like. If they refuse to take part in public debate then public opinion will, we may be sure, turn against them. Not before time. Let us see what we can achieve before this decade is out. But the reason why that road does that is quite interesting. It turns off the route along the edge of the desert through the now vanished temple of Amenhotep III (that's the one that had the famous "Colossi of Memnon" outside). It runs along (or just inside depending on what reconstruction of the excavated evidence you believe in) the southern wall of the enclosure around the building, which was of course aligned on the rising sun. The alignment of the 3000-year old temple defines the aligmnment of the road leading down to the Nile crossing. The pro-collecting lobbyists so often attempt to deny the right of the modern citizens of the "source countries" of the artefacts they covet to regard them, and the sites they come from, as part of their heritage. They argue that the populations which live now in countries such as Turkey and Egypt are culturally and genetically alien to the cultures and ethnicities of the creators of the objects they want to acquire without any concern about where they came from and how they came onto the market. After all even metal setected Roman finds from Britain cannot in any way be regarded as the cultural heritage of the British because "the Romans left Britain, didn't they?". But they forget about the "power of place" the ability of one's own "small homeland" to be a feature of identity and pride. Here on the road to Qurna crammed with tourist buses (yes, even at dawn - they've driven across the desert all night from the Red Sea resorts) the grain of the landscape was created by the influence of the work of Amenhotep III's architects. The temple has all but gone but the people of Qurna still live their lives in its virtual shadow, in more ways than one. The temple of Amenhotep III is a feature that contributes to the definition of where they live. Contributing to the creation of a "place", a function many ancient sites and historic biuldings and landscapes fulfill all over the world (except perhaps Antartica and Wisconsin). In my blog, I mentioned the trip to Abydos and Beit Khalaff the other day. The road map was pretty hopeless and we ended up going from village to village asking likely looking villagers and getting varying estimates of 'how far" away it was... The last guy we asked gave a blank look.. and then his eyes lit up "you want to go to the tomb of Djoser"? Now actually the tomb was not of Djoser (the builder of the step pyramid at Sakkara), but obviously local pride had endowed this somewhat imposing monument with a properly imposing identification as that of a real historical personage. This site is well off the normal tourist trail, and the villager's pride that a group of white guys had driven all the way from Deir El Bahari to come and see the local ancient monument was obvious. Collectors and dealers all too easily assume that all the people living in the countries whose decontxtualised archaeological evidence they buy and sell feel no connection at all with the past of the regions they inhabit, that the past of their own land for them is as much a "foreign country" as it is for US and western European collectors. This seems an over-reaching and insulting assumption. It would be a risky assumption that it is only an anathema for archaeologists to have the sites and landmarks of the "source countries" of coveted collectables dug over and ransacked as a source of saleable, leaving only a devastation of holes and a litter of discarded (non-commercially viable) artefacts all over the place. Today I have been accumulating lots of photos of archaeological (I use the term loosely as we shall see) holes in the ground. In the morning, taking more photos of the excavations in Hatshepsut's Temple. Then at lunch break the work done by the Antiquities Service in some service trenches along the front of the Temple of Ramsess III at Medinet Habu. I'll not be publishing those here though. In the afternoon a delegate from an international conference on mortuary temples being held in Luxor across the river showed me some 200 disturbing pictures of what she'd seen in the conference lunchbreak. There are two major temples over there. In the south Luxor, and in the north the huge Karnak complex. In antiquity they were linked with an avenue of sphinxes. Some bright spark in the town council decided it would be a jolly good idea to knock down all the old buildings on the route of the avenue, and dig out the avenue so tourists can walk along it. Now this is a fantastic idea. Luxor is largely a sprawling nineteenth century development, which means that there have been very few opportunities for excavation of the town (arguably one of ancient Egypt's most important centres) around the sacral space. There must be at least one royal palace in the area immediately adjacent to the temples, there will be evidence of trade and administrative functions, private houses of citizens of all ranks from the elite to the humble artisans. This not only goes for dynastic times, but Luxor retaiuned its importance into the Late Roman period at least and was still occupied in early Islamic times. In other words, large scale excavation here, of all places, would have a vast contribution to add to our knowledge of Egypt's past, and precisely in areas where the biases of the research questions addressed by most former investigations had left huge gaps. Not only that, the accociated layers of well-dated alluvium of the Nile flood would have its own story to tell about changes in this part of the Nile valley due to environmental factors. In other words, the avenue excavations are a dream site. The 200 photos I saw today (taken from the street, so no secret) show an archaeological nightmare. 3) Here we see the well-trained archaeological team hard at work carefully dissecting the micro-stratigraphy of this complex site with hand tools. Note how each worker has a labelled finds tray for the many artefacts recovered from each stratigraphical unit identified. These will them be taken to the finds hut to be washed, sorted and inventoried according to context. (I was actually walking down that street in the background last night after dark - it is right in the town centre). The observant reader may observe some discrepancies between the descriptions above and the pictures. Just like there is a discrepancy between what is happening here and real archaeology. This might have been acceptable in Napoleon's day and maybe Mariette's, but it really is not acceptable to treat otherwise unthreatened stratified archaeological sites in this manner this day and age. Let us recall that the ONLY reason this is being done by the town council is to make another tourist attraction. What price "heritage"? Let it be noted that just over the river in Medinet Habu, an Egyptian team did a perfectly adequate job of excavating a very similar sequence of deposits stratigraphically and methodically. I am sure the pro-collectiung ranters will be hapopy to learn that in the "source countries" for the stuff they covet, not all archaeology is being treated in the right and proper fasdhion. But I'd like to ask them, does this really mean it is "OK" to buy unprovenanced and potentially recently illegally exported ancient Egyptian antiquities? Do two wrongs make a right? Does buying such stuff "serve the Egyptians right" that the present Governor of Luxor (whose project this is) does not give two hoots for what the archaeologists think? (both national and international - for he received a strongly worded letter from the international egyptological community two years ago when he announced these plans). "EBay has drafted words to make it seem otherwise and the British archaeological establishment has said this is all a very welcome development! Hence our thesis: official coyness about the reality of the severe negative impact of legal metal detecting facilitates major heritage damage". Hear hear. The British archaeological establishment really has a lot to answer for (not only in this regard of course). At times the milieu as a whole comes over as a group of ineffectual wimps and hand-wringing jobsworths when it comes to facing real challenges to the still-buried archaeological heritage. Of course it would be too much to expect more than a handful of folk of such a calibre to speak out against the official doctrine of "outreach" (whatever that really is) to and "partnership" with collectors and despoilers (or simply to continue ignoring the problem) - which is what time and time again we observe from the British archaeological milieu in the area of dealing with artefact hunters, collectors and dealers. Goodness knows how they face up to the developers and other mass earth-movers. Or do they? Vignette: A RESCUE slogan - can archaeology in Britain do better than voice mere slogans? Like standing firm on an issue like the despoiling of the archaeological record for mere entertainment and profit? Postscript. What the.... ? I posted a picture of the slogan, and then had a glance at the website when posting a link to Rescue. Just look at what is the top of the RESCUE (let's put that in BIG letters) webpage at the moment? What on earth do they think they are representing here? Which (in)famous hoard found and then hoovered up unreported for the next ten days by a metal detector using artefact hunter (and then dug atrociously badly by a team of people who should know better) does this glittering piece of Gollum's gold come from? Clue: look back at earlier posts on this blog. Does RESCUE regard this as the essence of archaeology? Is this an example of conserving the archaeological resource (what actually RESCUE set out to press for when it was set up by a lost breed of British archaeologists all those years back), targetting it in an uncontrolled manner by artefact hunters? I say no. RESCUE apparently are of another opinion. You can see there rather wishy washy statement of position on "metal detecting" (ugh) in issue 99 (I think, it might have been 100) of Rescue News. Just what kind of "British archaeology" is RESCUE a "trust" and "independent voice" for these days: the potsherd, posthole and environmental sample type, or the tawdry get-on-the-TV-quick glittery golden Treasure goodies type? This rate, they will not be getting any subscription money from me in 2010.